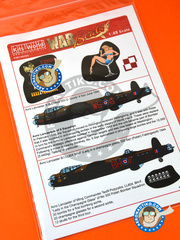 Decals for recreating the USAF units called "Victory Read" and "Slow Starter"
Decals for decoratin both Lancasters with registrations ED666 WS-G "Goofy" and LL804 BH-F "Lady in a champagne glass" landed at Faldingworth. 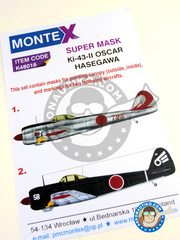 The set includes two masks for the markings and two masks for the canopy recreating these two decorations: 2nd Rensei Hikotai, Korea y 26th Rensei Hikotai, Java. 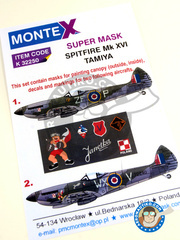 Decals and masks for recreating the Supermarine Spitfire flying in 1941 at RAF 129th Squadron, and the unit flying in 1942 at the 131st RAF Squadron. 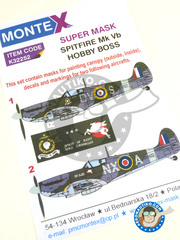 A fantastic decoration for the Supermarine Spitfire Mk. XVI operating on Polish army orders under the RAF flag in 1945. 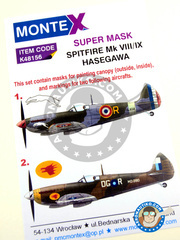 Set of two canopy mask (outside & inside) and one insignia mask for decorating the Supermarine Spitfire. 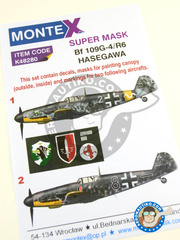 Decals and masks for recreating the Messerschmitt Bf 109 like it flew in 1943 in Lt. Erich Hartmann and Fw. Victor Petermann hands. 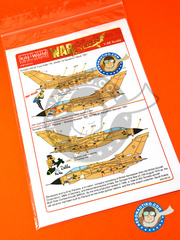 The RAF deployed several Tornados at the Desert War, in the so called Operation Granby. 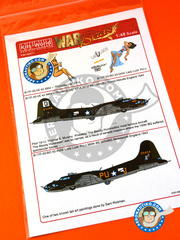 This decal recreates those units, being Foxy Killer FK, ZA465 16th Squadron Tabuk, Debbie y Snoopy Airways DD, ZD790 31st Squadron Bahrain, Cherry Lips CL, ZD850 2nd Squadron Tabuk, Helen – Snoopy Airways HH, ZD892 617th Squadron. 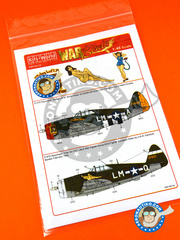 Decals for decoration the Republic P-47 Thunderbolt called "Stalag Luft III - Button Nose" with registration 42-26298, and the "Triss" with registration 42-7937 just like they operated back in 1944. 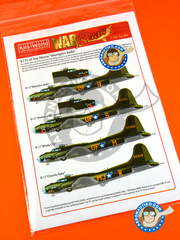 Decals for decoratin the B-17 just like the units called "Picadilly Lilly" y "Lady Luck" operated in England in 1943. 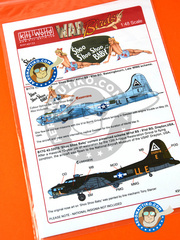 A curious decoration for the B17G with registration 42-32076 and "Shoo Shoo Baby" nickname. On one side, the decoration used at the end of the Great War, and on the other side its current looks nowadays at Drayton USAF Museum, after 10 years of restoration works. Decoration of two interesting units. 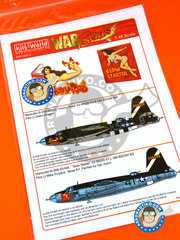 The first one, with registration 44-83514, belongs to the "Sentimental Journey" of the Commemorative Air Force Arizona Wing. The second belongs to a unit captured by the German army, with registration 41-24585 PU-B "Wulfe Hound" at the 360BS/303BG RAF Molesworth. 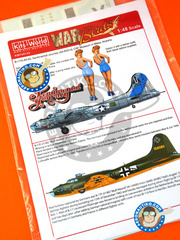 An extensive and exhaustive decals sheet with all B-17 from the Memphis Belle film, called Sally B, Baby Ruth, C-Cup, GeeWhiz, Windy City, Mother & Country and Clooney Baby. 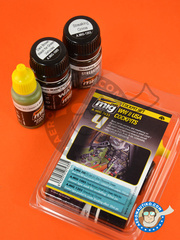 Basic set of colors for painting and weathering on FS34151 Interior Green color in WWII or US Navy most common American aircraft cockpits as P-51, P-40, P-38, Corsairs, Hellcats os Avengers. 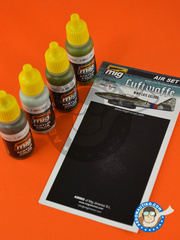 AMMO of Mig Jimenez: Paints set - WWII British cockpits | Color Set - RAF ; ; RAF ; RAF - A.MIG-219, A.MIG-1003, A.MIG-3004 - for all kits. 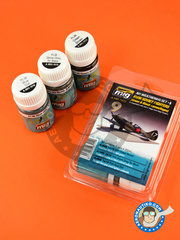 Don't mess up searching for colors for your British World War II planes: you have all that you need in this "World War II British cockpits" set. 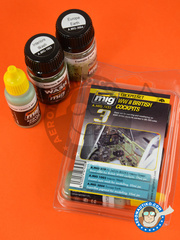 Set of three 35ml bottles of panel wash line and dirt effects, for using on World War II soviet airplanes using green and black camouflages. 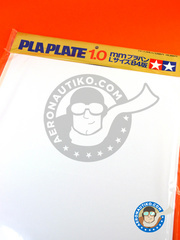 In cooperation with Jamie Haggo and Diego Quijano. 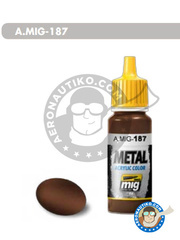 AMMO Air Set by Mig Jimenez of four 17ml acrillic color jars (called Luftwaffe WWII Late colors), used in Luftwaffe planes during the late World War II. 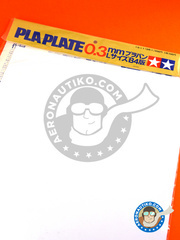 The set includes RLM 81, RLM 82, RLM 83 and RLM 76 tones. 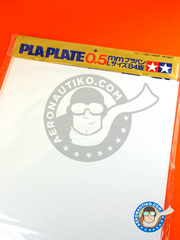 Pack of 5 sheets of white polystyrene for manufacturing your own parts.. Sheet dimensions are 26x36 cm and 0.5mm thick. 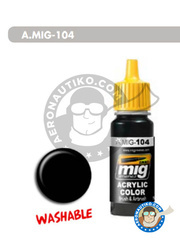 Acrylic and washable black paint specifically formulated to obtain a wide range of effects, such as chipping, shadowing, aging, wearing. 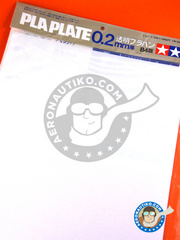 Heat on metal surfaces, such as exhaust pipes, engines or exhaust nozzles, gives them a very characteristic look. 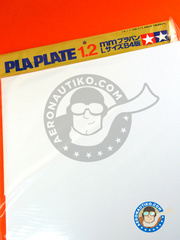 This metallic color recreates with precision such effect in a very realistic way in planes, civil vehicles and much more. Presented in 17ml bottle.